If you are in the market for a water flosser and are looking for a bargain, then this might just be an option. It offers many of the benefits of leading brand Waterpik, without the same price tag, but read on, because the low purchase price is a bit deceptive. 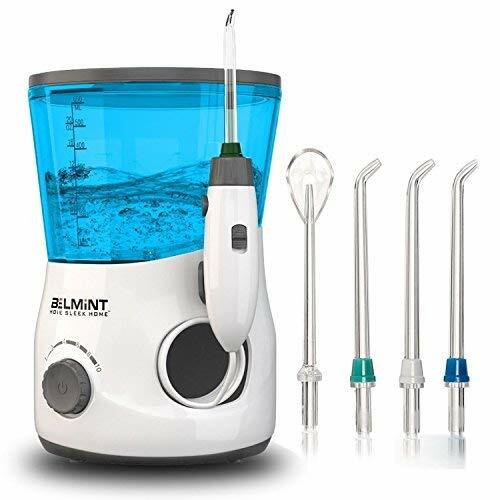 What is the Belmint Home Sleek Home Water Flosser? This is a countertop water flosser. Ideally used in addition to regular flossing, the unit takes water from a large, refillable water tank and delivers it at pressure out through the nozzle, which you control. The variable pressure settings offers a pressurised water jet to clean in between teeth and along the gumline. Connected to mains power it cannot be used wirelessly. Using a water flosser takes some practice and is not generally something you master first time you use it, but the skill and technique can be quickly learnt and oral health benefits achieved as a result. Step 2: Fit the nozzle you wish to use to the handle of the flosser ensuring it has clipped into place. Step 4: Press the power button to switch the unit on. Step 5: Slide the button on the handle to the ‘on’ position to begin water flow. Turn the dial on the main unit to increase or decrease the pressure. Brushing your teeth, be that with a manual or electric toothbrush only actually reaches about 60% of the tooth surfaces. The remaining 40% require use of interdental brushes or dental floss to reach the areas that normal brushing does not. Another option, ideally used in conjunction with these, is a water flosser. Electrically powered, pressurised water pushes against the teeth and in gaps, including under the gumline to release debris and bacteria that can cause bad breath and plaque. Whilst initially more expensive to buy a water flosser can be a much more convenient and effective way to achieve the interdental cleaning that your dentist will advise. For many, one of the biggest draws is that the water does not cut into the gum like floss can. Here are a list of the pro’s and cons having used the Belmint water flosser. Water tank – Reasonable size for extended usage time. Pressure settings – 10 pressure settings for a softer or more intense flossing. Timer – Built in 2 minute and 30 second timer for even flossing. Replacement nozzles – Sourcing these seems to be very difficult. Magnet – Holding the handle in place it’s not as robust as a clip mechanism. Quality – Given what you pay little to complain about here, but you need not spend that much more to get better value. Flossing is one of those tasks that most of us really dislike, it is a necessary evil. A water flosser can really help make this process easier. An alternative approach for some, it is a much more enjoyable and effective way to achieve the interdental clean. The Belmint Home Sleek Home water flosser is one such option that goes up against market leader Waterpik. It brings many of the same features at a cheaper price, or so it first seems. Pretty standard is the overall design of the flosser, to be fair I can’t really knock Belmint here. It is quite hard to be super innovative, when you need to accommodate the things you do with a water flosser. I wouldn’t dare suggest it is a copy of the Waterpik Ultra, but there are some similarities in the design. Sadly the build quality, whilst ok is not great and inferior to most others in my mind. It just feels a bit cheap in places. The main unit is made up of 4 key parts. There is the White colored base. Plastic in construction inside it is the pump and electrics that make the unit function. The power cord is wired into this section of the unit. It is designed to sit on a countertop or shelf in your bathroom, near to the sink. On top of this sits the water tank that holds 21oz (600ml) of water, that offers up to 90 seconds of usage time. Acting as a lid over the water tank and as a place to hold the provided nozzles is the Grey colored storage unit. The hinged plastic unit, fits on top of the water tank and provides a home to the 3 jet tips and the 1 tongue cleaner that come in the box. On the front of the flosser is the handle. This is the bit you hold in your hand as you floss. At the base of the handle is a hose that coils up beneath it and tucks into a recess within the body of the main unit for neat storage. This hose takes the water from the unit up into the handle. At the other end of the handle is where you connect the tips/nozzles into. The handle has a power control button and rotating mechanism built in, more on both of these in a moment. It clips to the front of the main unit via a magnet. Where most other models sit on/in a molded plastic holder, a magnet in the back of the handle attracts to a magnet on the main unit to hold it in place. A novel idea, but you have to be quite precise with aligning the magnets to keep it in place. They are not that strong, it is easily knocked off and to be honest, whilst smart not the most practical. To use the unit, it first needs to be connected to the power supply. It comes with a 2 pin US power adapter and supports 110v. With the power connected, lift off the water tank and fill it with 21oz of lukewarm water. There is a measure on the side of the plastic water tank. Once filled, position this back on top of the base unit and replace the tip storage unit/lid if you like. Fit one of the provided nozzles that come provided. You get 3 jet tips and 1 tongue cleaner. The nozzle fits into the hole on the top of the handle. Push it in place and you will hear it clip in. A button on the side of the handle needs to be pressed to release the nozzle. You might choose to disconnect it after each use, others like to leave it connected. The jet style tip/nozzle is suitable for most people with ‘normal’ teeth and oral health, but the likes of Waterpik, H2ofloss and others do offer a broader range to tips that are better suited to specific users needs. For example, they make tips specifically designed to clean more effectively around braces and implants. Whilst these nozzles will work on braces and implants, the more specialist design of these different tips can offer a better overall cleaning experience. If you wear braces or have implants or have periodontal pockets, best consider the alternatives. The tongue cleaning tip is a useful addition and as the name implies helps clean the tongue, a task many of us overlook. The design of the tongue cleaning tip helps reduce spray and pressure on the soft surface, whilst covering a larger surface area. A common cause of bad breath is failing to clean the tongue. The pitted surface is an ideal home for bacteria to grow. Lasting 6 months on average, in the box you have enough jet tips to last 1 user 18 months. The tips do have colored fittings on them, which can be useful if you share the water flosser. Each user can have their own tip, depicted by color as you share the main unit. The big disappointment here is that replacement nozzles are impossible to buy. I could not find them anywhere and even going direct was of no help. All Be,mint told me was that they don’t sell replacement nozzles, but can replace those that are broken within the 1st year of ownership. The availability of nozzles are much better with competing brands. Ok, 1 user might get 18 months, but if you share with other family members, after 6 months the unit may be fit for the trash. With the tank filled, nozzle fitted, it’s now time to power the unit on. On the base unit, you press the Grey pressure control dial to turn the unit on. On the handle, you have a sliding switch that turns the flow of water on or off. Providing the switch on the handle is set to ‘0’ the water will not come streaming out like it does on some units, the moment you turn it on. It is best to place the nozzle into the mouth first, before sliding the switch to the on position. Once running you can then adjust the dial on the base unit to change the pressure. There are 10 settings ranging from 0-90 PSI. This means you can find a setting that is just right for you, be that softer or more intense. You can adjust the pressure at any time. As the water flows out, the idea is you aim the jet of water at 90 degrees to the gumline and move from tooth to tooth, with a slight pause in between each. Rather impressively, built into this oral irrigator is a timer and pacer. It runs for 2 minutes, but an audible alert can be heard at 30 second intervals. The idea, is much like an electric toothbrushes built in timer, it helps you floss evenly through the mouth. I actually found this quite helpful and the clean offered by the water jet to be pretty good overall. Many flossers don’t offer this. Whilst not essential, its a useful guide. My testing has not been conducted in any way that might be considered clinical, so I cannot say with hard fact that it was better or worse than the competition, but it felt similar. This flosser does not have such an accreditation. Depending on your technique the 21oz tanks will give you 1 decent flossing session or 2 short sessions if you want a quick floss. In most instances, the 90 seconds of flow from the tank is just enough time to floss both upper and lower teeth, properly, once. It is nice to have the pressure control on the main unit, rather than on the handle. Whilst perhaps harder to reach, a problem I found with the H2ofloss is the pressure control on the handle can be quite fiddly. It was too easy to adjust the pressure when you did not mean too. Also nice to see is the rotating top to the handle. Able to be twisted a full 360 degrees, you can twist the nozzle to the ideal angle whilst in use. It takes a bit of practice to get the technique right. The same can be said for the actual flossing process. Although not huge amounts of water, the way water flossing works is you essentially constantly dribble into the sink the water that has run off the teeth and gums. For the first few goes it can be a bit messy until you understand how to move the handle and your lips to ensure a smooth flow and not lots of spray. What I find particularly great is that water flossers allow better cleaning of the back teeth. When using normal tape floss, getting in the tight gaps with our fingers and thumbs can be difficult. The slim nozzle reaches with ease to the back teeth. It is worth noting, that this unit is quite loud in use. Whilst I did not test side by side, it appeared louder than Waterpik units at the higher pressure settings. You would unlikely want to use this is others in your home are light sleepers. Overall it’s not all that bad to actually use, but it’s far from perfect when you consider some of the small oversights, notably replacement nozzle availability. It was not all that surprising to see the Belmint website suggest that the retail price for this water flosser is $50. Given what it offers, it could most certainly be argued that it is worth this. However, thanks to the super competitive and price sensitive world we live in, online retailers battle it out to offer this at the best price. It takes no effort at all to buy it for $35 with Belmint’s own website at the time of writing selling it for just $33 as part of a sale. Normally the manufacturer’s own website remains at the recommended retail price. Despite searching, I did not see this in sale in the stores you might expect. Walgreens, Walmart, CVS, Target did not appear to stock the unit. Whilst the water flossers they do stock tend to vary, they all do stock some, just not this one. The $50 suggested retail price makes it very closely matched to premium brand Waterpik and sadly this is just not able to compete, so it needs to sold cheaper to consider it a worthwhile purchase. Here at Electric Teeth, we like to give a rough idea of how much it will cost to own a product like this over its lifetime. It gives an approximate price and a way of calculating roughly how it compares to the competition. Some products can be cheap, but preshible parts are expensive to replace or vice versa. The Belmint Home Sleek Home water flosser throws up a few surprises. Whilst there may be at least $15 to be saved on the purchase price, it is not possible to factor in the cost of replacement nozzles over the 3 year period. I was unable to find them anywhere and even Belmint themselves were unable to help. It comes with 3 classic jet tip style nozzles, which would normally last 6 months each. This therefore means, out of the box, you have 18 months worth of tips. You need to buy another 3 tips, to give your 3 years usage. You therefore have some choices to make. Continue using the nozzles longer than you normally would, or dispose of the whole unit and buy a new one…not cool! I should imagine based on similar products that they would cost about $2.50 each. If you could get the replacement tips at this price, this would mean that over 3 years, the flosser will cost $42.50 to own, which works out at $0.04 per day. But, assume you had to replace the whole unit. Now the cost would be $70 or $0.07 per day. You would now be better off buying Waterpik to get the premium brand and be a bit more environmentally friendly. However, you do have the option of H2ofloss, which is actually cheaper and has replacement tips for sale! So, whilst on face value it seems cheap long term it really isn’t all that promising in my opinion. There is an argument that you get what you pay for with Belmint. It is certainly one of the cheapest options out there, but this does show a little in the overall build quality and reliability. Whilst is passes the basic standards you would expect of a product, it does not give you that extra level of confidence that some others do. Whilst during my hands on testing I have not experienced any major issues with quality and reliability, I am less confident about this in comparison to other ‘cheap’ brands I have tested. There appears to be many more complaints from other users and a distinct lack on information about the warranty and support procedures. I am led to believe you have a years warranty and there is a satisfaction guarantee in place, if you are not happy. I have not tested this and it is not well documented. If it lasts 2 years, you will probably have gotten reasonable value from it, but if you like peace of mind and quality, you might want to look elsewhere. When you look at the features and what what this water flosser offers for the price, things appear to be very positive. It is however only when you dig a little deeper, actually use the unit and live with it do you realise that there are better options out there – we cover a few in our best water flosser 2019 post. Whilst it does what it says it should, there are a few issues you have to contend with. The magnet that holds the handle in place is weak and just a bit of a faff in comparison to a basic plastic moulded clip. The availability of replacement nozzles is an issue as it the overall quality of the unit. Whilst it works, you are better looking at alternative options such as the H2ofloss if you want superb value for money, or check out products like the Waterpik Aquarius for one of the best water flossing experiences. Can I use mouthwash in the Belmint? Do you own or have you used the Belmint Home Sleek Home Water Flosser ?